This whopper of a dress on the left is the dressgasm of the day. It was sold on eBay a few months ago after the seller acquired it from a museum in the Northwest, as I recall. It sold for a mind-bloggling price of $1,275, but the dress is absolutely worth every penny considering the great condition. The lady who wore this dress was tiny. Keep in mind she was wearing a corset and the dress had stays sewn in as well but the bust was only 31 inches and the waist was only 24 inches. Her natural waist without the corset was most likely about 26 or 27 inches. Let me put that into perspective. I am five feet tall on the dot and my measurements fluctuate between 32 and 34-inch bust and 28 and 29-inch waist. With a corset, I get no smaller than a 27-inch waist. This woman was probably no taller than 5’2 and the average height for a woman in 1860 was between 5’0 and 5’2, so if you look at me, I’m about average for that time. I fit into a lot of these dresses but even I’m too “fluffy” for this dress. 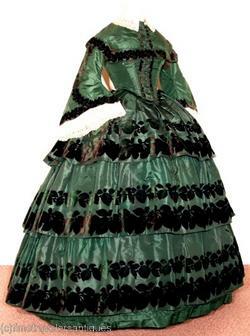 This dress is made of forest green silk taffeta. This is clearly a mid-to-late 1850s dress because of two hallmarks: the multi-tiered skirt and the pagoda sleeves. 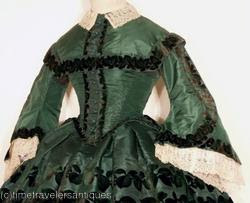 While these things carried into the 1860s, they were far less prevalent as the blockades limited fabric importing and all efforts and resources were put into feeding, clothing and arming the armies. 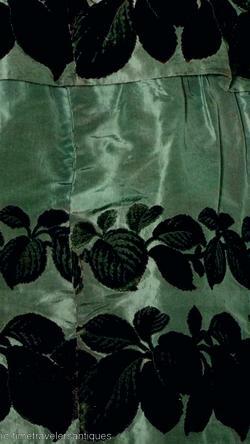 Black velvet foliage patterns line the edges of the skirt tiers and the sleeves. The trim around the collar and sleeve cuffs is called point de gaz. This woman was clearly quite wealthy if she could afford silk taffeta in that quantity and intricate and unique black velvet trim on top of it. It is a quality piece in structure since there has been very little serious damage between 1856 and 2009. It probably had some machine stitching when it was made. >I could have gotten into this dress when I was between the ages of 16 and 28. But after the birth of my first child, it would have been all over me. 🙂 Gorgeous. >This is a beautiful dress! I love the color!! How pretty!